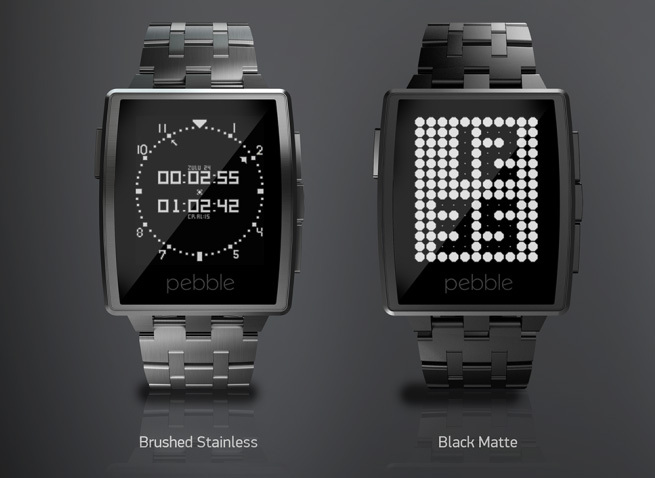 The Pebble smartwatch was first released around a year ago, after one of the most successful Kickstarter campaigns ever. Originally, Pebble Technology’s goal was to raise $100,000 through crowd sourcing, with backers who pledged $115 receiving a Pebble as soon as they were available. They went on to raise a staggering $10,266,844 with 68,928 people pledging during the 2-month campaign. By January 2014, they had shipped over 300,000 Pebbles. Now, Pebble Technology have released the 2nd generation of the famous smartwatch called the Pebble Steel. With other big tech manufacturers looking to jump on the smartwatch band-wagon and with Samsung already in the market with their Samsung Galaxy Gear, the Pebble Steel hits at just the right time. Its priced $100 higher than the original at $249 but comes with a new steel body which gives a more premium, upmarket feel and features a toughened Corning Gorilla Glass protected, scratch resistant display. The first generation Pebble had more of a sporty feel, while the Pebble Steel is going in a smarter, business orientated direction with a brushed stainless or Black Matte finish. The ePaper display still looks nice and crisp and you should be able to get a week’s worth of normal use between charges. It’s also thinner than the original with an RGB LED light that indicates the charge status. In a nice touch, each Pebble Steel comes with both a Steel and leather strap thats interchangeable. Like the original Pebble, the Steel is waterproof to a rating of 5ATM, meaning that going for a quick swim shouldn’t present any problems. Pebble are also launching the Pebble Appstore, an open-platform centralised location for sharing apps optimised for wearables. It will reside within the original app on your iPhone or Android device and you can send your new apps straight to the Pebble. It started shipping world-wide on the 28th January 2014, priced at $249. For more info about the Pebble Steel Visit get pebble.